Did ‘Star Wars: The Force Awakens’ draw inspiration from Operation Focus during the Six-Day War? 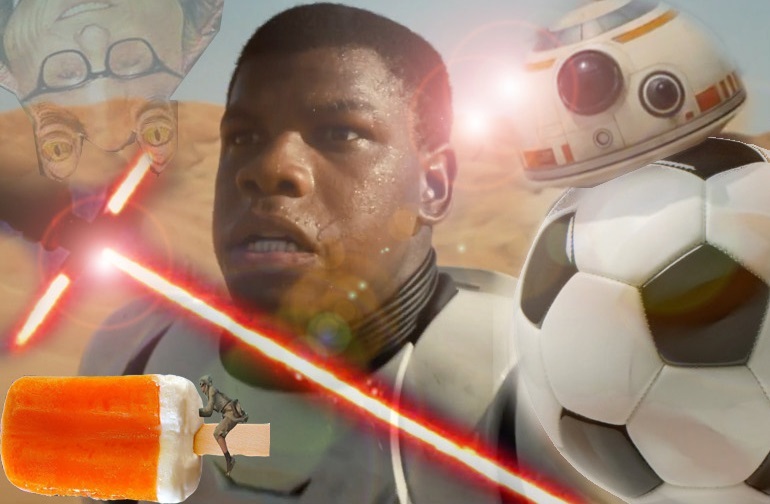 The new teaser trailer for “Star Wars: The Force Awakens” is out, and it looks pretty darn amazing. It’s got a little something old, a little something new, and George Lucas has been replaced by J.J. Abrams. Score. However, the history nerd in me has his interest piqued because of the squadron of X-Wing fighters seemingly headed into battle about 100 feet above a large body of water. Did Mr. Abrams draw inspiration from Israel’s Six-Day War — Operation Focus in particular? If so, then I’m more excited to see the film. If you’re not familiar with what the Israeli air force did during the Six-Day War in 1967, then look it up. In short, Israel’s air force pulled off a daring operation in which they flew over the Mediterranean — so low that they would not be picked up by Egyptian radar — and then destroyed the entire Egyptian air force. If J.J. Abrams needed the Rebel Alliance to pull off an inspiring win, then drawing from Operation Focus was a brilliant move. If it turns out to have absolutely nothing to do with the movie, then I guess we’re just left with really cool images of X-Wing Fighters flying over water. It’s a win-win situation. Let me know what you thought of the trailer below, and make sure to include your thoughts on the new lightsaber as well. I think the crossguard looks cool, but I’m not sure if it would work in battle. Since I’m not a Sith Lord, I’ll withhold judgment until December, 2015. Where Lucas was genius is how he incorporated sound into his movies. Not only are the star wars images iconic; the familiar noises are too- you can’t help pay attention to the theme music, the shriek of a TIE fighter flying by, and the sound of an igniting lightsaber……all used very well in Mr Abram’s trailer. Even though it really tells nothing, the clip captivates you. Looking forward to the movie. Unless the crossed lightsaber serves a purpose; I’ll have to say I like the traditional single blade ones the best- but it is distinctive! Indeed, Patrick! And wasn’t THX sound created due to that genius? Thanks, Hube! I think that’s the perfect historical battle to draw from if the story involves a Rebel Alliance that is surrounded by a deadly enemy determined to attack. Flying X-Wings that low to the ground would be incredibly dangerous, but also provide a huge element of surprise. I think Lucas definitely should be praised for his initial vision, but somewhere along the line he seemed to have surrounded himself with “Yes Men” and it all went downhill from there. I think the prequels could have been essentially one movie — Revenge of the Sith. That was the best of the three newer releases, in my opinion, but even that one was a mish-mash of missed opportunities. Theoretically, the crossguard would be able to protect the users hands from being chopped off (a bit of a problem in the Star Wars universe!) and also be used as a weapon in battle. I’ve seen people complain about how dangerous it would be, but … that’s the point. That isn’t a lightsaber that any old person would wield. 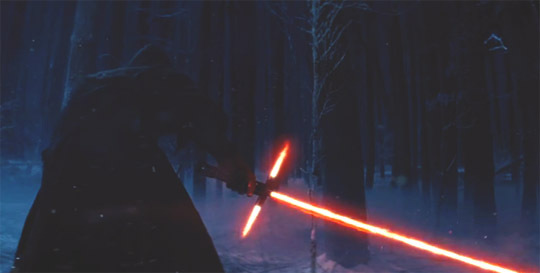 That looks like the lightsaber for a Sith Lord. Duh! To me, the trailer was a bit scanty. They might as well have been still images; maybe the trailer is just meant to excite the crowd and remind the world that a new Star Wars is on the way. Fair enough, but they did promote it as a teaser trailer. I think in that sense it got the job done. I’m assuming that the first “real” trailer will come with one of the Marvel movies next summer. Perhaps. But speaking of Marvel movies, Guardians of the Galaxy (excellent movie, by the way) is essentially Star Wars with Han Solo as the star instead of wishy-washy Luke Skywalker. I enjoyed Guardians of the Galaxy quite a bit, but I did have a few issues with it. They were small for the most part, but nothing that would keep me from recommending the movie to others. Ah yes. I generally prefer the Marvel Cinematic Universe to Marvel comic books. I think Marvel Studios knows that some of the politically correct stuff they pull in the comics would turn off millions of potential customers, so they tread a bit more lightly. I’ve been very impressed with the movies. So have I, and for the same reasons. The Marvel movies are just fun all around. So have I, obviously. I think they’re aware that they have to appeal to a mainstream audience, and like you said, the politically correct pap they put into the comics would drive potential customers away. They get away with it in the comics because it’s a smaller audience and fewer people read comics today than they did say, 20 years ago. bare with me here Doug, as I myself am a king-sized Star Wars fanatic, who follows the Expanded Universe, is aware of the changes coming and a fan of the prequels and a card carrying member of the charity group the Rebel Legion, which is the sister group to the 501st Legion, and collectively raise 20 million dollars in charitable funds worldwide each year. Judging from casting reports, we can safely assume that there is once again a NEW Jedi Order, just like in the EU, and that the Rebellion (most likely) became the New Republic, and after 30 years and the Return of the Jedi, it would put our heroes once more into the seat of power. Now you are a political critic as much as you are a pop culture critic, so you know all about perception, reality, and presentation. The trailer shows John Boyega (said to be our hero for this trilogy) as an Ex-Stormtrooper on the run from the Imperial Remnant (or the Republic? ), who clearly sport at least enough money to get brand new armor and TIE Fighters. The question is does that place the Rebellion as the “heroes” of this piece? Or the bullies? Afterall, if there are more Jedi again and their forces are whittled away, the hero could become the villain. Would you personally be comfortable with the shifting of roles throughout the piece as we journey with our heroes and the Jedi and the Sith, who are the pure good and pure bad, surrounded on all sides by two warring bodies who may or may not be all good or all bad? Or would you rather a rip-roaring adventure that harkens back to the pirate films and Bond films of yesteryear where you walk out at the end like you just went on a roller coaster? It’s a fair question because the Original Trilogy was the latter, and the Prequel Trilogy, while not showcased as effectively as it could have been (and was in the EU) being most certainly the former. Cheers! And keep on Smashing the Slott-verse! Would you personally be comfortable with the shifting of roles throughout the piece as we journey with our heroes and the Jedi and the Sith, who are the pure good and pure bad, surrounded on all sides by two warring bodies who may or may not be all good or all bad? Or would you rather a rip-roaring adventure that harkens back to the pirate films and Bond films of yesteryear where you walk out at the end like you just went on a roller coaster? Can I have my cake and eat it, too? 😉 My guess is that is what J.J. Abams is going to try and do, although I think he’ll lean a bit more towards the former. I personally like what he did with the new Star Trek movies, even if they were far from perfect. I’m not a huge Star Trek guy, but I think he injected life and excitement into a franchise that seemed to be running on fumes. I think with Star Wars he’ll do an honorable job respecting the past while bringing the brand into the future. Episodes I-III are basically like Rocky V for me — I’m just going to basically ignore them the rest of my life and pretend they didn’t happen. I can’t wait until Disney tells Christopher Nolan it will give him whatever he wants to direct one of the new Star Wars movies. That’s going to be something worth watching. As long as Dan Slott is writing The Amazing Spider-Man and doing weird things to Peter Parker, I’ll keep posting random reviews of his work. 🙂 Thanks for reading! I’m pretty excited for this movie, if only to see how Disney leaves its mark. Completely noticeable, or not at all there? Jurassic World also had a trailer release this week, but aside from based Pratt there’s not much to be hyped about. The Jurassic Park movie seems…pretty useless and unnecessary to me. I thought the trailer looked pretty bad, but it seemed like a lot of other people liked it. Was there anyone really clamoring for the movie to get made? I’m not really getting that one. Looks pretty good. As long as there aren’t any Ewoks or Jar-Jar Binks and as long as it stays true to the series, I’ll be happy. “Would you personally be comfortable with the shifting of roles throughout the piece as we journey with our heroes and the Jedi and the Sith, who are the pure good and pure bad, surrounded on all sides by two warring bodies who may or may not be all good or all bad? Or would you rather a rip-roaring adventure that harkens back to the pirate films and Bond films of yesteryear where you walk out at the end like you just went on a roller coaster? I would prefer they stay closer to the latter. I’m honestly tired of moral relativism in entertainment. Thanks. I’ve been busy lately, which is why I haven’t posted in a few weeks. I always thought it a bit laughable that the Ewoks, a race of tiny furballs with Stone Age technology, would be able to defeat the technological Galactic Empire. The original draft of “Jedi” had the Wookiees beating the Empire, which makes more sense. But yeah, Jar-Jar was an embarrassment. He was intended as comic relief, but he wasn’t funny at all. Even when I was nine and saw the movie for the first time, it made me shake my head. I remember going to “Revenge of the Sith” in 2005 hoping he would be killed by Vader. He wasn’t, but I was glad that Lucas listened to fans and that Jar-Jar’s role was reduced. I’ve known exactly one person who thought Jar-Jar Binks was a great character, and this individual would get pretty defensive if you dared to say anything bad about the character.